I’m curious to know how I use the timer widget to change the time zone, as it is an option within the widget. Ultimately the end user will be able to do this within the published app. I added the Real-Time Clock and am getting accurate times but I don’t know how to change the time zone in the timers widget. Your help is valued greatly! As I understand it, the App gets it’s time from the Server, adjusted by the RTC widget and it’s TZ settings, not the phone itself, so as long as those are correct then so should be any Timer Widgets. Please just apply then using it and the rest Blynk will do the job ! Haha I have experienced on this widget yet from the last vacation to move between countries where the time were being shifted. At the beginning I open the app that I noticed my timer changed so it made me curiosity. Taking not long I knew the reason due to timezone changed … ok anyway as long as your phone is set to sync with the local time then everything is ok bro. The widget set times do not change when you move and the flower is still watered in time as set. Real Time Clock (RTC) is used for another purposes like you want to get the time from the timezone preset and so on. Thanks Gunner. Is it possible to replace the RTC Widget with the Time Zone setting that is in the Timer Widget? It seems it would be more practical than having to explain to customers what the little clock icon is and how they must change the settings in that before setting the Timers. Here is a picture of the Timer Widget Time Zone section. Your customers can benefit from the standalone app we can customize for you. However, once you setup a commercial subscription, I suspect the little things like that will be handled differently so as not to “confuse” your customers. Isn’t the purpose of a prototype to prove the functionality of a product before production? Yes, but only up to a point. The final tweaks, bells, whistles and flashing lights will be added to the custom version of the app as part of the customisation stage - provided that is possible. 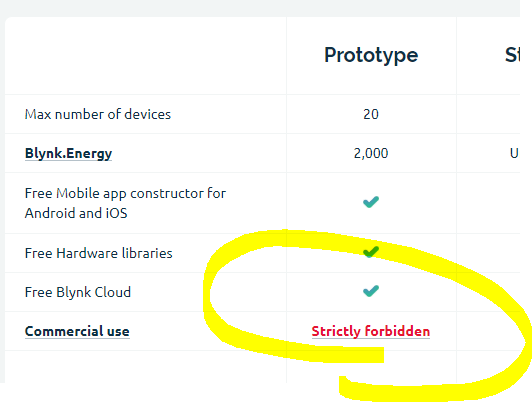 So, with Blynk, the process should be to prototype your product to the point where you have the majority of the functionality you need, then to open a dialogue with the Blynk guys about what’s missing. If you run into issues during the prototyping process then start talking to the Blynk guys earlier, so that you don’t waste time and effort. In fact, as Blynk 2.0 is rumoured to be on the horizon, it would probably be best to run any ideas past the Blynk guys at a fairly early stage in the process so that they can steer you in the right direction. You may also find that they have some additional ‘goodies’ that you can use, which aren’t available in the free version of the app, and they may have some pre-built code that they can share with you for certain pieces of functionality.